We have covered before the topic about how to install a widget on your site. But not everyone manages their own site. They have a webmaster who maintains it on a regular basis. 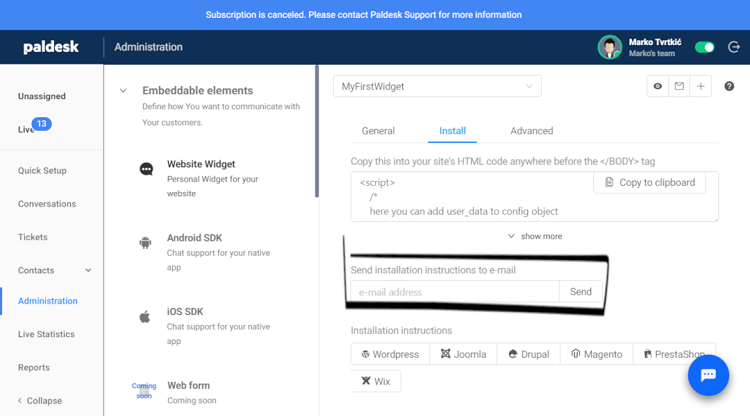 In this guide, we will cover how you can send email instructions to your webmaster on how to set up a widget on a website. How do I send widget install instructions? Step 1: Once you are logged in your Paldesk account. Go to the sidebar and select ‘Administration’. Step 2: Once you are in the ‘Administration’ tab, then you click on ‘Website Widget’ in ‘Embeddable elements’ tab. Step 3: Inside ‘Website Widget’ tab click on ‘Install’. Step 4: Once you clicked on ‘Install’, in textbox bellow type an email address of your webmaster. Step 5: Click the ‘Send’ button. You have successfully sent an email with installation instruction to your webmaster.